Gabriel & Co. have created a captivating engagement ring with plenty of antique charm beautifully combined with contemporary design. This three stone engagement ring takes a simple design and captivates with pavé set diamonds paving the 14k white gold band. The milgrain borders paired with side etchings craft a unique impression of past and present in one engagement ring. Blue-white diamonds with very few internal birthmarks. Best paired with white metals: platinum and white gold. Neutral to slightly warm white diamonds with few internal birthmarks. Can be paired with any metal - platinum, white gold, yellow gold or rose gold. Warm white diamonds with very few internal birthmarks. Best paired with warm metals: yellow gold or rose gold. Blue-white lab-cultivated evertrue diamonds with very few internal birthmarks. Best paired with platinum and white gold. Neutral to slightly warm white lab-cultivated evertrue diamonds with few internal birthmarks. Can be paired with platinum, white gold, yellow gold or rose gold. Make the moment perfect with a ring that fits. Shopping for rings together? Ask for a professional ring sizing when you visit our store,or request a free ring sizer to be sent to your home.Remember to meausure at night when the finger 1s at its largest. Need it faster? Download our printable nng sizing guide below. You'll need a current ring. The ring is a surprise? Check out our tips for finding your significant other's ring size without revealing the secret. Fill out he form below to receive a free ring-sizer in the mail for an accurate in-home measurement. Please Note: Ring sizers are only available for customers within the United States. Why keep your preferences a secret? Share this style with your significant other. We ship your jewelry to you for free, regardless of price or distance. Orders placed online before 3 p.m. PST Monday - Friday will be delivered within 3 business days. Orders placed after 3 p.m. will be processed the following day. All orders are shipped via UPS Next Day Air and you'll be notified when your order has shipped. Shipping times may vary for customized orders dependent on the time needed to create your masterpiece. We will contact you with updates throughout this process. Need to keep the delivery a secret? We've got you covered. We can arrange for special delivery options. We offer a 14-day, full-refund return or exchange policy for any unworn items bought in-store or online. Items that are not eligible for return or exchange include: items that show any wear, special orders(any item that has been customized to your liking), custom engraved jewelry, and jewelry that has been worked on by another jeweler. For online returns, contact and we'll provide your Return Authorization code along with a pre-paid shipping label and instructions for packing, shipping and insuring your item. For an in-store return, simply bring in your eligible item with it's original packaging and documents. Feel at ease with our flexible payment options. Choose the plan that's right for you - short-term deferred interest, longer term or revolving credit. All feature no annual fee and online account management. Our onsite artisans are happy to adjust this design to make it your own. Since we will build your new ring from scratch, we can configure it with a different metal, center diamond shape, carat weight, ring size, side diamond weight, or all of the above at your request. Customized designs can take up to two weeks to produce in our workshop and fall under a special warranty policy. To talk to an Icing On The Ring team member about your design, call us at (888) 565-6150 or fill our the form below and we will respond promptly. With Icing On The Ring, you are guaranteed a lifetime warranty, free cleaning & repolishing, lifetime 100% trade-up policy, and financing made easy. We want to be your jewelers for life. 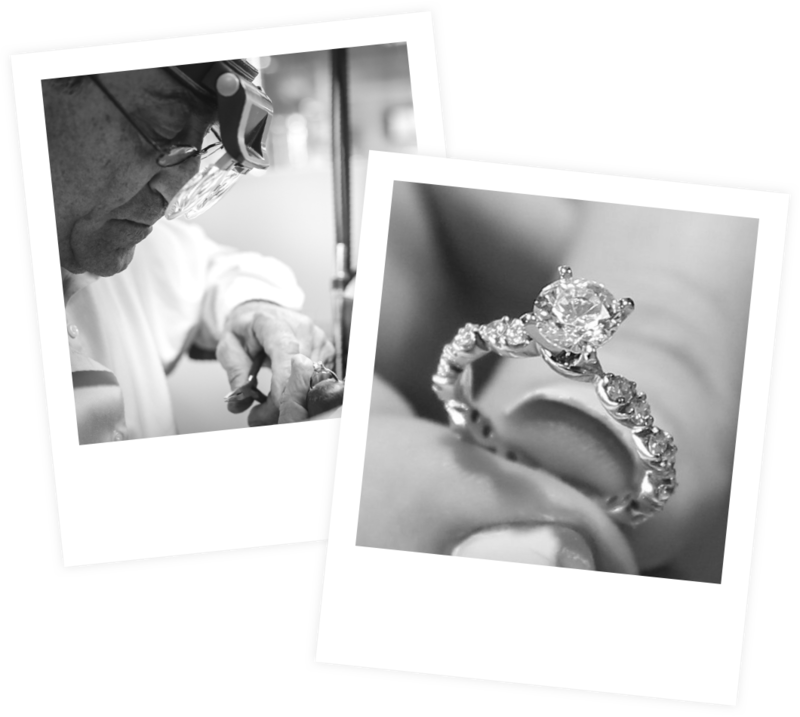 Our on-site craftsmen have over 75 years of cumulative experience "on the bench." 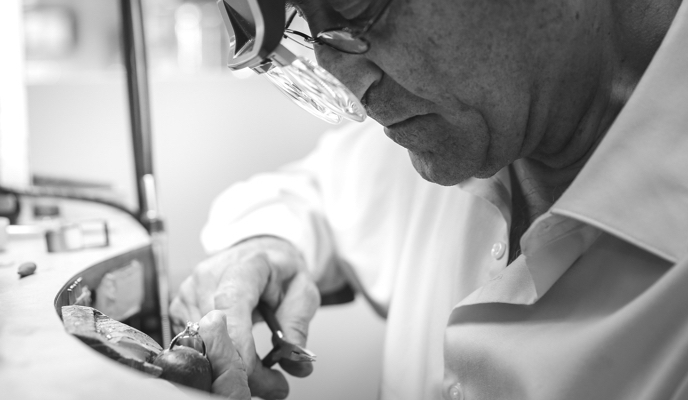 This vast depth of experience enables us to produce handcrafted rings using time honored techniques, including fabrication, casting, burnishing and engraving, during the production process. With extensive experience on a variety of challenging projects, we bring quality craftsmanship and attention to detail to bear on each and every job. Need help deciding on a ring or diamond?